A little over a month ago, I gave fans the top 10 story lines to keep an eye on throughout San Diego State’s 2013 spring football practices. After a disappointing end to the 2012 season, there was concern that the team might take some time to recover emotionally, hindering their progression. After seeing the team this spring, however, the consensus is that the players have moved on and they are ready for bigger and better things in 2013. Last season is over, and it is time for the 2013 San Diego State football team to move on and create its own legacy. This attitude amongst the players is greatly attributed to the culture that former head coach Brady Hoke instilled and current head coach Rocky Long has further developed. 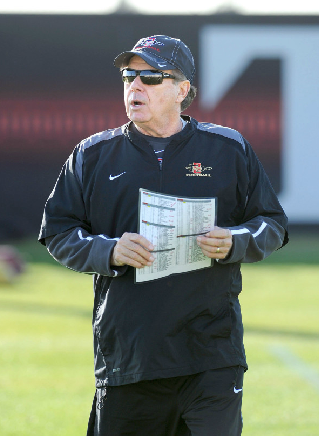 Although new offensive coordinator Bob Toledo’s offense is very similar to what San Diego State has run in the past, there is a lot of new terminology that will take time to learn. Players will have the next several months to dive into their playbooks and hit the film room to become more comfortable with Toledo’s X’s and O’s. One thing that was very refreshing to see was the creativity of Toledo, which was evident in the spring scrimmage. On the first drive, the Aztecs scored a 13-yard touchdown on a unique backwards lateral pass to former tight end and current left tackle Bryce Quigley. This play was a clear indication of what can be expected from San Diego State this season, as Toledo proved he is not afraid to run an occasional trick play. Although the tight end position is still a bit of a concern, Robert Craighead has emerged as a reliable option. Adam Roberts suffered a foot injury, but it does not appear to be serious and he is expected to be healthy come fall. Craighead and Roberts will likely see the most playing time this year. Junior college transfers Aaron Boesch, Dominique Bierria and Mike Miller have potential, but all three will need to continue to gain strength and size as they adjust to the Division 1 level. Keep an eye on their progression into the season. Be sure to also look out for incoming freshmen David Wells and Darryl Richardson in the fall to see if they can come in and compete for playing time right away. San Diego State traditionally plays four tight ends, and it will be an open competition to see who will join Craighead and Roberts as the main contributors this season. King Holder, who was expected to fill one of the two vacant cornerback spots, missed spring due to an injury. This opened the door for players like Pierre Romain, J.J. Whittaker, Mahbu Keels and Damontae Kazee to prove their worth. Whittaker and Romain performed well throughout the spring, and Keels had arguably the best outing in the spring scrimmage. Kazee, on the other hand, is an up-and-coming young player with loads of potential. 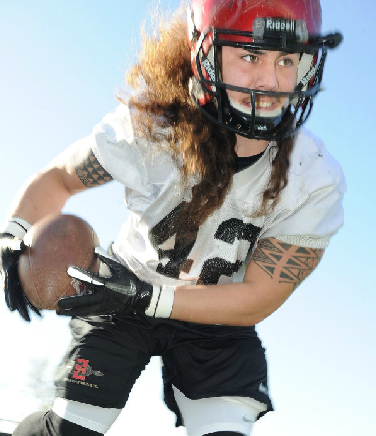 He has a chance to become a big-time player for the Aztecs, but it may take another year of development. If Whittaker can stay healthy, expect him to start alongside Holder this season. San Diego State will likely play with a rotation of four cornerbacks, meaning Romain and Keels will also see the field often. Look for Kazee to be a contributor on special teams, as well as another reliable option at cornerback if injuries occur. It didn’t take long for Long and Toledo to give returning starter Adam Dingwell the nod, but it will take awhile for them to decide on the backup. Jake Bernards and Quinn Kaehler split time with the second-team, and they will compete throughout fall camp until one separates himself from the other. 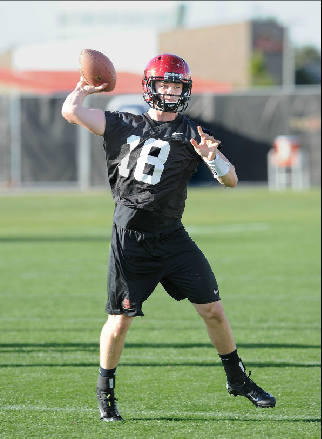 Kaehler seemed to have the edge at the end of spring – he saw the most action in the spring scrimmage and completed all seven passes he threw – but Bernards is a savvy veteran with a solid understanding of the pro-style offense. It will be a close battle between the two that likely won’t culminate until a week or two before the first game of the season. Like the quarterback position, San Diego State was not able to establish a clearcut backup running back this spring. Chase Price and De’Saan Hardwick showed flashes of talent, but with several fumbles in the spring scrimmage, the competition is far from over. Price remains the frontrunner for now, but he will continue to compete with Hardwick, Dwayne Garrett, Ronnie Daniels and Donnel Pumphrey in the fall. One thing that was clear throughout the spring was the dominant play of Adam Muema. He seemed to be playing at another level, shedding off tacklers with an array of quick-footed jukes and power moves. The backup running back battle may not be as important as originally expected because Muema may be able to shoulder most of the load himself in 2013. Expect him to be one of the top running backs in the nation this season in terms of yardage and touchdowns. San Diego State has had six wide receivers drafted in the past decade. Who’s next? 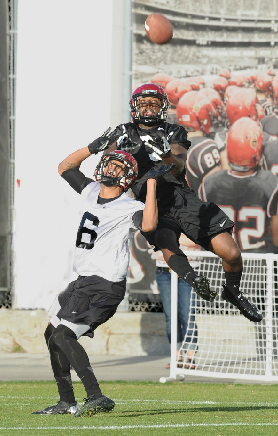 Ezell Ruffin, Colin Lockett, Tim Vizzi and Dylan Denso are four solid targets that will help the Aztecs vastly improve its passing game this year. Look for San Diego State to have an explosive passing attack with Ruffin and Lockett leading the way and Vizzi and Denso as great possession receivers who are counted on in critical situations. A testament to the newly established depth, Toledo has added a four wide receiver package that has been absent in years past due to a lack of dependable options at the position. At the end of spring, four players have likely solidified a starting job amongst the offensive line. Bryce Quigley (left tackle), Japheth Gordon (left guard) and Zach Dilley (center) are near-locks at their respective spots, and redshirt freshman Nico Siragusa has lived up to his expectations and is the frontrunner to start at right guard. At right tackle, Paul Rodriguez and Terry Poole split time with the first-team throughout the spring, and the two will continue to battle for the starting job in fall camp. Although it is unclear who will earn the job, the intense competition is sure to breed a reliable starter by the time the season rolls around. Redshirt freshman Daniel Brunskill impressed the coaching staff this spring, and he will likely be used as an extra lineman in short-yardage and goal-line packages. Barring injury, Jordan Thomas, Cody Galea and Sam Meredith will retain their starting spots. All three had a solid spring and will continue to improve in the offseason. Jon Sanchez, Dontrell Onuoha and Everett Beed reaffirmed their worth throughout the spring, creating incredible depth at defensive end. All three backups will see playing time this season with the constant rotating that Long employs with his defense. Although backup defensive tackle Dan Kottman suffered a shoulder injury in the spring, junior Kenny Galea’i filled his void and performed well with the second-team. Kottman is expected to be healthy by fall, but don’t be surprised if Galea’i locks up the backup defensive tackle spot. After watching San Diego State this spring, it’s clear to see that Long has his defense playing an extremely high level. 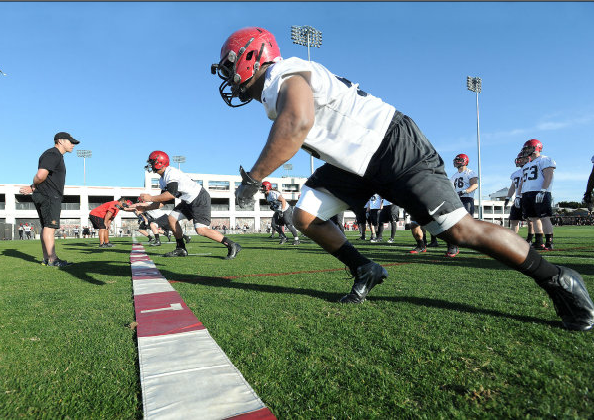 The Aztec defense is oozing with talent, and many of the players are noticeably more comfortable in the 3-3-5 defense.. This combination of talent and knowledge in the system is sure to give the Aztecs a serious edge on the defensive side of the ball. The main source of this talent comes from the linebacker and safety positions. At linebacker, opposing offenses will fear the trio of Nick Tenhaeff, Jake Fely and Derek Largent. Fely has bulked up and added 10-15 pounds since last season, and now weighs around 215-220 pounds. Vaness Harris, Josh Gavert and Micah Seau round out the second-team, and all three are more-than-capable backups who will see the field often. Jacob Driver will continue to make an impact on special teams and will step up when needed on defense. At safety, seniors Nat Berhe and Eric Pinkins will lead an experienced group. Marcus Andrews missed spring due to an injury, but he and Gabe Lemon will compete for the third starting safety. As for the young players at these positions, Seau, Blake Rodgers, Tony Bell, Stan Sedberry, Nic Rudolph and T.J. Hickman saw a ton of action this spring, and each showed their ability to compete. Although they may not see a ton of playing time in 2013, they could be heavily relied upon in 2014. Aztec legends Kevin O’Connell and Akbar Gbaja-Biamila were in the press box during the spring scrimmage providing commentary for the crowd. It was a popular new addition to the event and the duo did a great job keeping the fans informed and involved with the action. Former players and ‘Aztecs For Life’ Ray Rowe, Kevin Wells, Jack Hawley, Ray Peterson, Tyson Thompson, Lane Yoshida and many more played in the Alumni Touch Football Game before the scrimmage. According to the commentary of O’Connell and Gbaja-Biamila, Hawley and Yoshida were co-MVPs of the event. Kicker Wes Feer and punter Joel Alesi each had a solid spring. Feer nailed a 49-yard field goal in the scrimmage and rarely missed throughout the series of practices. Although there was no defenders rushing, Alesi punted very well in the scrimmage. Chad Young did not play in the scrimmage to preserve his health and give more reps to the younger fullbacks. His aggressive and hard-nosed style of play will continue this season as he opens holes for the running backs, and he will be a huge part of the Aztecs running game. The senior has also emerged as a vocal leader of the team, and is a top candidate for team captain on the offensive side of the ball. Along with Roberts, Kottman, Holder and Andrews, linebacker Ryan Jack and offensive lineman Kwayde Miller suffered injuries, limiting their participation. None of the injuries were deemed as serious and all players are expected to be healthy for fall camp. Andrew Feaster, Bruce Leaupepe and Osmond Nicholas are no longer with the team for various personal reasons. Suffered a minor injury, expected to be fine by the fall. I’m not 100% sure, but considering that he never played at Washington and that he’s a walk-on, he might not have to sit out a year. Either way, it’s highly unlikely that he will play this year due to the depth at linebacker. Remember his name for 2014, though.